You already have an existing system. It’s in production, it’s providing value to users every day. This is what brings the money to the company and pays everyone’s salary. Unfortunately, the state of this software will not cope with the market demand trends. You need to transform your system, without loosing your customers! 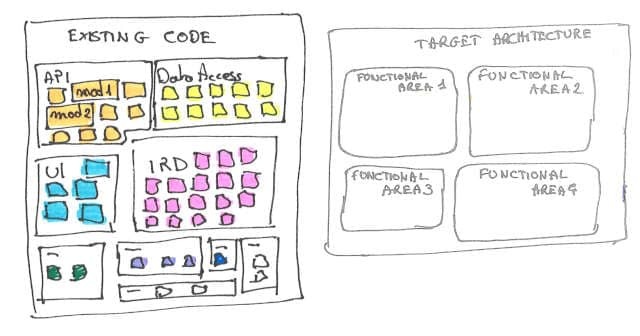 We saw how Event Storming helps to agree on a shared target architecture vision. When you have an existing system (and legacy code), the gap between reality and vision can be daunting. Here is an Event Storming follow-up activity to get a feeling of how much work we’ll need to get there. This is also the 17th post in a series about how to use Event Storming to kick start architecture on good tracks. It all started with misadventures with Big Design Up Front. This consists of changing the code one step at a time, while always keeping it working. This is the safest and most sustainable strategy if the reality and vision are not too different. 💡 Full, drop-in, bing-bang rewrite is often a poor strategy. It’s very risky, late, and non-sustainable for the people. If you system is small enough, and you have new ideas to put in, then create a new product! DHH gave a great talk about how they rewrote Basecamp 2 and 3 as new products. If your system is large, full rewrite is usually not be a realistic option. You’ll need to find a way to do incremental rewrite. This is usually a mixed rewrite AND refactor approach. Here is an example. First: refactoring a sub-systems behind an API and building an anti corruption layer. Then applying rewrite techniques like canary releasing and Strangler app on the sub-system. For more ideas, have a look at this talk from Eric Evans. This workshop will give a visual assessment of the refactoring effort involved. It will serve a base for discussion and might help you to identify obvious migration first steps. 💡 Refactor vs Rewrite? The best strategy is usually a hybrid between both. This is where the workshop starts. Book a room and stick this map on the wall. 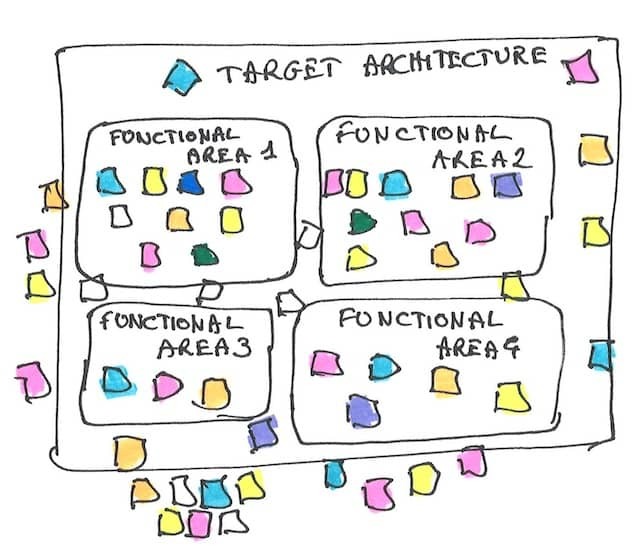 During the Event Storming workshop, you should have identified your target bounded contexts. That’s when attendees will work. They need move the existing files post-its to where they would fit in the target architecture. The colors will give visual clues about the ‘distance’ between the reality and the vision. We should have a first gut feeling of how complicated the migration will be. Target bounded contexts and current modules seem a good overlap. Files that are currently close to each other will mostly remain close in the vision. That’s good news, and the migration should not be too complicated. Incremental refactoring is probably the best strategy in this situation. The mosaic of colors tells us that the current and target architectures don’t have a lot in common. The path to get there will be long. Rewriting, or hybrid approaches might be better strategies here. All attendees can visualize the distance between reality and vision. It’s a good time for a discussion. Try to reach a consensus about the general migration strategy. Keep in mind that we have a bias towards rewrite. As Joel taught us, it’s always more risky in practice than in theory. Try to push for refactoring most of the time. If you are really hesitating, check this post that explains how to quantify a business case for a rewrite. For large systems, the solution will almost always imply both refactoring and rewriting. Replacing an in-house generic library with an off-the-shelf third party. It’s an obvious part of a refactoring strategy. It would also simplify a rewrite down the road. Domain concepts are usually pretty stable through time. So gathering some core aspects of the business in a single place is a good move. It’s part of refactoring, but it will make rewrite easier if we can reuse this core business logic. Some parts of both current and target designs might already match. Incrementally rewriting or refactoring these small parts might be easy quick wins. Use large-scale incremental refactoring techniques. I guess I’ll post some live coding videos about these techniques someday … so stay tuned. It’s incredible how much answers we can get out of a few days of Event Storming. Running your own is not as difficult as it sounds. Go ahead, and start your own! 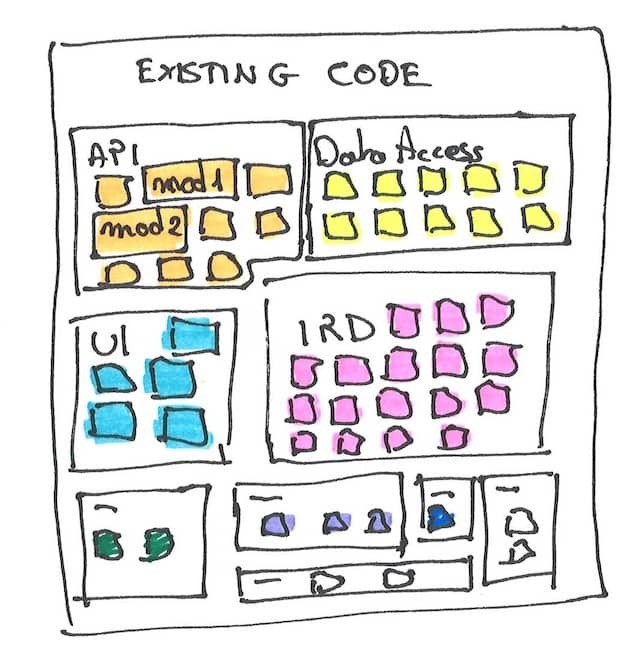 Through this series of posts, I went through a lot of activities that we can run around Event Storming. But guess what, I’m not finished yet. 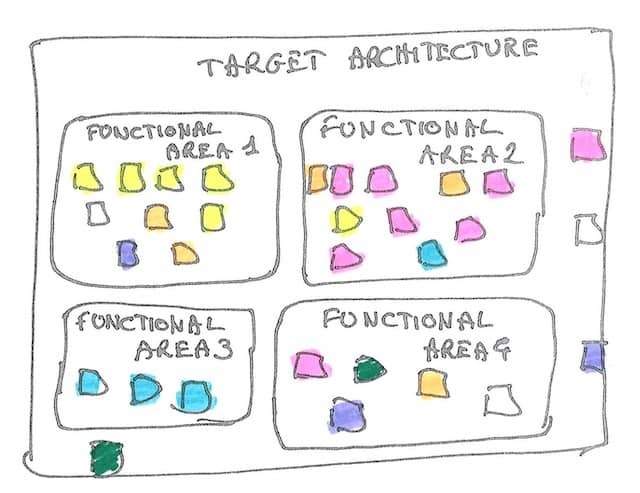 In the next post, I’ll explain how we can create teams that support our target architecture. This was the 17th post in a series about how to use Event Storming to kick start architecture on good tracks.